A statement shared through PC Gamer has announced that Dontnod's upcoming RPG Vampyr will be delayed until 2018. It was slated for release on November this year. We got a good peek of the game's demo during E3 this year and the game showed quite good potential as an RPG centering around vampire mythology. Dontnod CEO Oskar Guilbert, however, stated that the game's quality should not be compromised due to the goal of meeting the development's deadlines. A technical issue occured causing the team's schedule to be affected, but Oskar Guilbert reassures that it has now been solved. The delay will alow the team to further polish the game where players can experience Vampyr's ambitious semi-open world with a complex story. 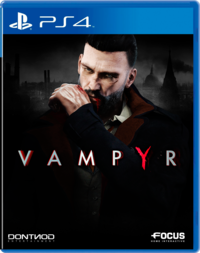 The positive aspects we've seen about the game's capability in weaving the vampire lore into its gameplay mechanics showed a lot of promise, and if it means the final product will retain this, waiting for a few months for its release shouldn't hurt that much.